This wholesale toilet paper is for use with the Compact Coreless dispenser system (GEP-56784) also available through ReStockIt.com. This is a perfect system for public washrooms that are looking to cut down on costs while still providing the clientele with strong and soft toilet paper. Buying bulk toilet paper alone from ReStockIt.com is going to help save on costs, but this product is especially cost friendly due to its coreless design which results in rolls that have twice as many sheets as standard toilet paper rolls. You still get great 2 ply wholesale toilet paper, but your washrooms will run out much less often, and you have to spend less time sending people in to change the rolls in your dispensers than you do with other types of wholesale toilet paper. It saves you money, and it saves you time - the Compact White Coreless Two Ply Bath Tissue available at ReStockIt.com. Compact® coreless toilet paper dispensing systems answer key needs for facilities managers when it comes to toilet paper for the restrooms. These high capacity systems help you avoid running out between service intervals and help reduce maintenance time typically spent changing out conventional toilet paper rolls. In addition, these systems save up to 95% in packaging waste compared to GP PRO's standard roll toilet paper by eliminating stub-rolls, corrugate cores, paper roll wraps and the outer cardboard shipping case. And because the Compact® case has a smaller footprint, it requires less storage space. 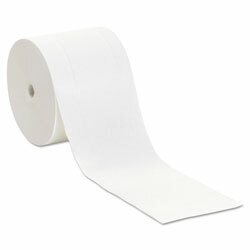 Finally, today's work force expects to have quality 2-ply, perforated toilet paper for use at work. Instead of having to reach up into a 'giant' dispenser to find the end of a low-quality toilet paper roll, Compact® coreless toilet paper dispensers are designed to give the facility high capacity for continuous service. GP PRO is a division of Georgia-Pacific Consumer Products. We deliver well-designed, durable and easy-to-maintain professional solutions to meet the handwashing and cleaning needs for a range of business applications. 4.75 inches White Coreless Toilet Paper from Georgia Pacific! 2661 In Stock today. Love the fact that there is no cardboard tube. Easy to fill the dispenser and love that you can fill it with 2 rolls at a time. Worth the money. These are the best rolls for businesses. They last and last. PLUS - free shipping! No wasted space in [...] storage.